Bay Hill Club & Lodge edges along the shores of the Butler Chain of Lakes, sprawling across 270 acres of softly undulating landscape that provides more elevation changes than what can be found on most Florida golf courses but not enough to be considered hilly. The 9-hole Charger at Bay Hill Club & Lodge in Orlando, FL is a resort golf course that opened in 1969. Designed by Bob Simmons, Charger at Bay Hill Club & Lodge measures 3309 yards from the longest tees and has a slope rating of 137 and a 36. The 18-hole Country Club of Orlando in Orlando, FL is a private golf course that opened in 1918. Designed by Brian Silva, Donald Ross, Geoffrey Cornish and Robert Trent Jones, Sr.
Eagle Creek is a British style course, from the bunkers to the chipping areas. It is a new 18-hole 7,198 yard-Par73 championship Orlando golf course and is located minutes from Orlando International Airport, near Lake Nona. The East/North at Grand Cypress has a diverse layout that puts priority on accuracy rather than strength or distance. The course is sportier and more wooded than the less generous North/South combination, which is the club's original layout. The 18-hole EastWood Golf Club in Orlando, FL is a public golf course that opened in 1989. Designed by Lloyd Clifton, EastWood Golf Club measures 7176 yards from the longest tees and has a slope rating of 135 and a 75. The 18-hole Fairways Country Club in Orlando, FL is a semi-private golf course that opened in 1972. Designed by Bill Amick, Fairways Country Club measures 5332 yards from the longest tees and has a slope rating of 110 and a 65. The 9-hole Grande Vista Golf Club in Orlando, FL is a resort golf course that opened in 1997. Designed by Ron Garl, Grande Vista Golf Club measures 2408 yards from the longest tees and has a slope rating of 113 and a 31. The 18-hole Hawk's Landing Golf Club in Orlando, FL is a resort golf course that opened in 1986. Designed by Joe Lee, Hawk's Landing Golf Club was later remodeled by Robert E. Cupp III. 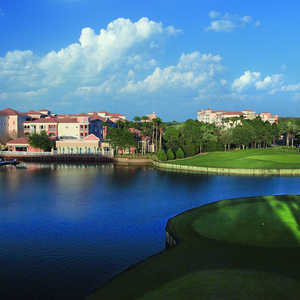 The 18-hole Lake Nona Golf & Country Club in Orlando, FL is a private golf course that opened in 1986. Designed by Andy Banfield and Tom Fazio, Lake Nona Golf & Country Club measures 7215 yards from the longest tees and has a slope rating of 140 and a 75. This Robert Trent Jones Sr. design is one of the area’s most venerable venues. The fluid beauty of MetroWest provides for a challenging but playable experience. Wide rolling fairways give all levels of players the opportunity to find the short grass, and the four sets of tees working from 7,051 yards down to the 5,325-yard forward tees make hitting greens in regulation a reasonable endeavor. The National course is a classic American-style layout that rolls through 200 acres of southern woodlands and wetlands. Unique bunkering, tree-lined fairways and intriguing green designs define shot making challenges. In particular, golfers are apt to remember the National for its testing par 3 holes and for the double green shared by holes 4 & 16. If the three 18-hole combinations provided by the North, South, and East nines at Grand Cypress Golf Club aren't enough, golfers can try their hand on the New Course, which is also a Jack Nicklaus Signature design. The 18-hole course stands as Nicklaus' homage to the legendary Old Course at St. Andrews, the famed birthplace of golf. The 18-hole North Shore Golf Club in Orlando, Florida is a semi-private golf course that opened in 2001. The course slides around lakes and wetlands, and then detours through a grove of large ancient oak trees before re-emerging into the clear at the finish. The North/South Course is the original layout at Grand Cypress Golf Club. In total, the club features 45 holes of Jack Nicklaus Signature golf that are divided into three nines: the North, South, and East, and the 18-hole New Course, which is a traditional Scottish links golf course. The 18-hole Orange Tree Golf Club in Orlando, FL is a private golf course that opened in 1972. Orange Tree Golf Club measures 7036 yards from the longest tees and has a slope rating of 141 and a 74. Since opening in 1957, Rio Pinar Country Club has hosted several PGA and LPGA events. Some big-name players have graced the links at Rio Pinar, including Arnold Palmer, Lee Trevino, and Julius Boros. The golf course is one of the oldest in the area and the traditional layout has become a local favorite among all skill levels. Shingle Creek Golf Club lies along historic Shingle Creek in Orlando - the headwaters to the Florida Everglades. This par-72 David Harmon-designed course is not only near the happenings of International Drive, it's also offers easy access from Orlando International Airport with what seems like its own exit off the Beeline (Toll Road 528) at Universal. Grand Cypress' South/East Course blends elements of the more challenging North/South combination and the gentler East/North. The course plays through woods as well as natural water hazards that come into play on a number of holes. The 18-hole Stoneybrook East Golf Club in Orlando, FL is a public golf course that opened in 1997. Stoneybrook East Golf Club measures 6842 yards from the longest tees and has a slope rating of 135 and a 73. 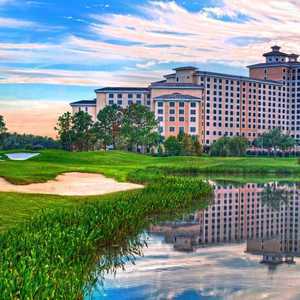 The Ritz-Carlton Golf Club, Orlando, Grande Lakes sits along the pristine headwaters of the Florida Everglades, surrounded by live oaks, towering pines, and palmettos. Two-time British Open Champion Greg Norman designed the golf course. He and his team focused on preserving the area's natural beauty and ecosystem. The 18-hole Wedgefield Golf Club in Orlando, FL is a semi-private golf course that opened in 1965. Designed by Roy Albert Anderson, Wedgefield Golf Club measures 6936 yards from the longest tees and has a slope rating of 129 and a 71.